The recent film Concussion and the book League of Denial: The NFL, Concussions and the Battle for Truth, on which the film was based, have focused considerable public attention on mild traumatic brain injury (MTBI) and its potential implications. But the challenges of understanding and dealing with those implications are far more widespread in the United States military. More than 300,000 service members were diagnosed with MTBI between 2000 and 2015, according to data from the Armed Forces Health Surveillance Center. Those large numbers—along with the responsibility this country has to its service members—offer an obligation to pursue some better tools to objectively assess, and ultimately better treat, the frustratingly imprecise world of MTBI. Whether your concern focuses primarily on our service members, children playing contact sports, or college and professional athletes, the need to know more about MTBI is genuine. Recent MRI research described in this month’s E-News Exclusive found a surprisingly high rate of objective evidence of injury—although researchers must learn just what that evidence means—in military service men and women with MTBI, perhaps a significant step in improving understanding, diagnosing, and treating head injury. A study of MRI exams performed on 834 service men and women who received mild traumatic brain injuries (MTBI) from blast-related incidents found revealed the presence of white matter T2 hyperintensities in 52% of those patients. Researchers from Massachusetts Institute of Technology and Massachusetts General Hospital say ultrasound waves may enable ultrarapid delivery of drugs to the gastrointestinal tract, which could lead to more effective treatment. A study presented at RSNA 2015 found that gastric artery embolization may be an effective treatment for morbid obesity. MRI and CT imaging done on remains dating back to the late 16th century or early 17th century showed clear signs of heart disease, according to RSNA. Researchers in China say that children who experience extended periods of parental absence show larger volumes of gray matter in the brain, according to research released at RSNA 2015. 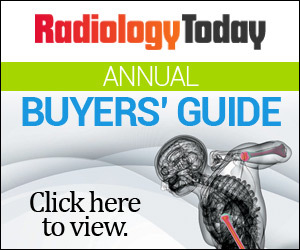 Coming up in our February issue is our Imaging IT Buyers’ Guide. Contact sales for more information.